The Office of Global Engagement has opened nominations for the Outstanding Global Engagement Award and the Jackson Rigney International Service Award. These awards recognize NC State faculty and staff who have made significant contributions to the university or the world in international research, scholarship or service. Nominations for both awards must be submitted by the college or administrative unit to the Office of Global Engagement by Monday, January 28, 2019. Nominees for both awards will be recognized at the annual Global Engagement Exposition on Tuesday, April 23, 2019. The two awards and the nomination process are described in here. On November 1, University College Commons was renamed Holmes Hall. Holmes Hall recognizes the groundbreaking achievements of Irwin Holmes Jr., the first African-American to receive an undergraduate degree from NC State. The College of Textiles received its largest ever gift — $28 million — from Fred Wilson Jr. and his family, who represent three generations of college alumni. This unrestricted gift to the college’s endowment fund names the Wilson College of Textiles in perpetuity, and will support the college’s greatest priorities and needs, from scholarships and fellowships to faculty support and cutting edge equipment. NC State DELTA’s annual report is now available. This year’s report shows how DELTA elevates and reimagines education through new initiatives, programs and services with a strong focus on quality. In the past year, DELTA launched the Online Course Improvement Program, added new enterprise-level academic technology tools and raised awareness and enrollments in many online and distance education programs. Efforts in 2017-2018 resulted in empowered faculty and successful students. Nominations for the Outstanding Extension Awards and Outstanding Engagement Awards are now open. These awards are to encourage and recognize members of the faculty and EHRA staff who are nominated and selected by their respective colleagues, schools or units on campus for their outstanding contributions to extension and engagement. The full awards process and timeline can be found here: 2018 OEA Criteria and Guidelines. Submit nomination letters via this form. The deadline for nominations is January 18, 2019. Send questions or comments about the process or the nomination form to Samantha Graham at sjgraha2@ncsu.edu. Nominations are now being accepted for the 2018-19 Gertrude Cox Award for Innovative Excellence in Teaching and Learning with Technology. The deadline for nomination submission is January 25, 2019. As the use of technology in teaching and learning changes, this award adapts to reflect those changes. Please visit the Cox Award website to learn about the updates in criteria and eligibility, required application materials and award recognition. For more information, please contact Judy Austin in the Office of Faculty Development at jcaustin@ncsu.edu or at 919-513-3636. The Provost is responsible for reviewing the administrative performance of deans and vice provosts at least every five years. Two reviews have been scheduled this semester. As part of each review, the campus community is invited to attend an overview presentation of the unit’s goals and accomplishments. Senior Vice Provost Mary Lelik and the Office of Institutional Research and Planning – Monday, December 3, 1-2 p.m., Currituck-Hatteras Ballroom, Talley Student Union. Dean Jeffery Braden and the College of Humanities and Social Sciences – Wednesday, December 5, 1:15-2:15 p.m., Mountains Ballroom, Talley Student Union. The review process also includes surveys of specific populations (e.g., senior leadership, advisory committee members, unit employees) who interact regularly with Dr. Lelik and Dean Braden. If you are invited to participate in a survey for one or both reviews, your thoughtful and timely response helps to ensure that the leadership review is as accurate and comprehensive as possible. Faculty and staff can receive a flu shot from Student Health at an on-campus flu clinic or at the Student Health pharmacy without an appointment. Faculty and staff are encouraged to take part in the NC State vs. Chapel Hill Flu Shot Challenge by filling out a survey after they receive a flu shot on campus. NC State’s Office of General Counsel is a dedicated team of legal advisors, counselors and professional staff committed to serving clients by facilitating creative and collaborative solutions. In order to better serve university faculty, a special Faculty Edition of the Howling Counsel newsletter presents FAQs related to teaching, supporting students, conducting research, and other common scenarios, and provides hotlinks to offices that can provide assistance and to relevant web-based information. The Institute for Emerging Issues’ ReCONNECT to Community Forum is now scheduled for Tuesday, November 27 in Asheville. ReCONNECT to Community explores this rise of disengagement and provides strategies to re-energize citizens, focusing on solutions that work. The event will highlight community initiatives from across the state and share innovative strategies to engage residents and solve local challenges. 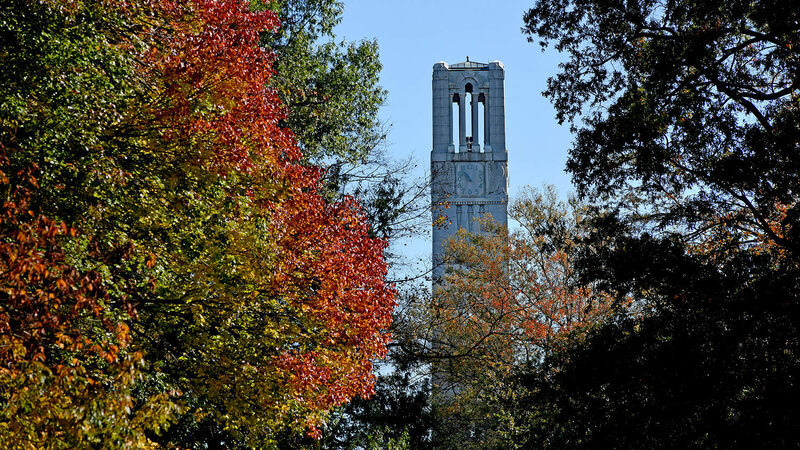 If you’re a member of the Wolfpack community who has won an award or honor — or if you know someone who has — University Communications and Marketing would love to hear about it. Please use this form to make a submission. Monday, December 3 is Ombuds Day 2.0, rescheduled from October due to Tropical Storm Michael. Your NC State ombuds – Mike Giancola (Student Ombuds) and Roy Baroff (Faculty and Staff Ombuds) – will be on campus at various locations throughout the day to provide information about ombuds services and to celebrate, including drawings for coffee and ice cream coupons. HR has begun implementing the first phase of its reorganization plan. This structural change will enable the division to enhance HR services at NC State and proactively meet the evolving needs of the campus community. Changes to HR’s current organizational structure will include but are not limited to the creation of two new units: HR Operations and HR Strategy. Read more about all of the exciting changes to HR. As part of the university’s holiday energy savings initiative, Chancellor Woodson has approved the modification of NC State’s 2018 university official holidays and closings calendar to also close the university on Monday, Dec. 31. Employees will be required to use comp time, annual leave, bonus leave or special bonus leave for this day during the 2018 holiday break. If the employee has no leave available to use, he or she can submit a request for leave without pay. For information on the holiday energy savings initiative, please visit Energy Management’s Holiday Energy Saving Initiative site. For questions regarding the 2018 university official holidays and closings calendar, please contact Benefits, Employee Wellness and Work Life at hrsbenefits@ncsu.edu. Each year, every academic program offering a degree or certificate is evaluated by its faculty to improve the effectiveness of the program. Periodically, we present an example of what a selected program has done for improvement. In 2018, the Genetics – Bachelor of Science program assessed students “ability to solve genetics problems.” To measure this outcome, the genetics faculty used final exam questions mapped to the outcome in GN 423. The analysis showed students were highly skilled at solving evolutionary genetics problems, but lacked the same level of skill in solving population genetics and quantitative genetics problems. As a result of their analysis, the genetics program took new action to improve the genetics curriculum. Faculty introduced more practical application examples in courses and connected quantitative and population genetics problems to real world applications to assist students in understanding their necessity.